I love many different types of Asian food flavors. And even though I know it’s probably just the Americanized flavor version, lo mein is one of my favorites. And, unfortunately, it’s also mostly carbs. (Which is probably why I love it so much.) 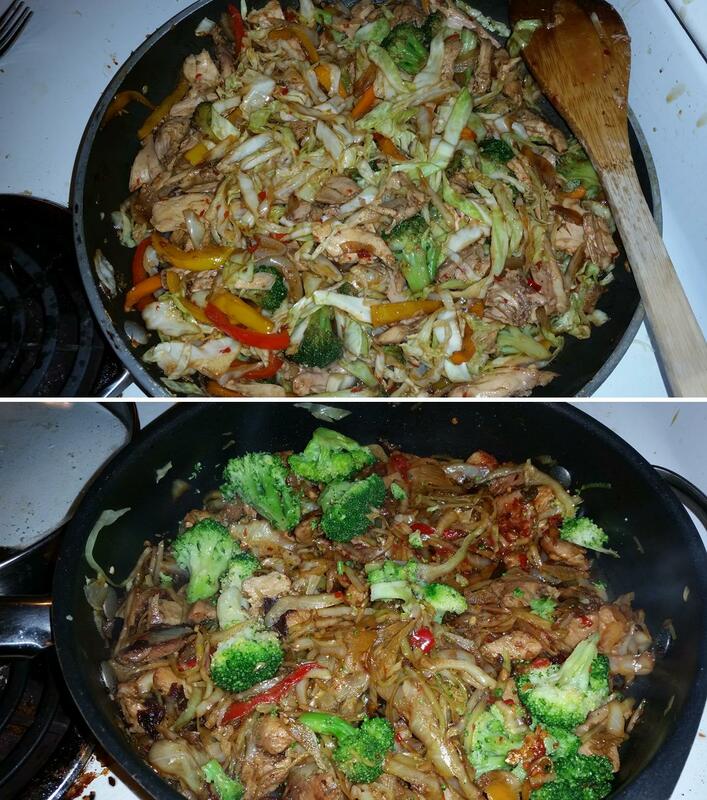 So I was really happy when I ran across a few recipes for low-carb, or faux, lo mein. Really, it’s a cabbage stir-fry, but calling it lo mein makes me feel like I’m really having a special treat. Add sesame oil and minced garlic to skillet and warm over medium heat until garlic just starts to sizzle. Add peppers, onion, and meat and cook, stirring frequently, until meat is cooked through. Add cabbage, cover and cook 3–5 minutes until cabbage is wilted, shaking occasionally to keep meat, peppers, and garlic from sticking to bottom of pan. Add broccoli, soy sauce, and chili-garlic sauce and cook, stirring, an additional 3 to 5 minutes. Serve hot. 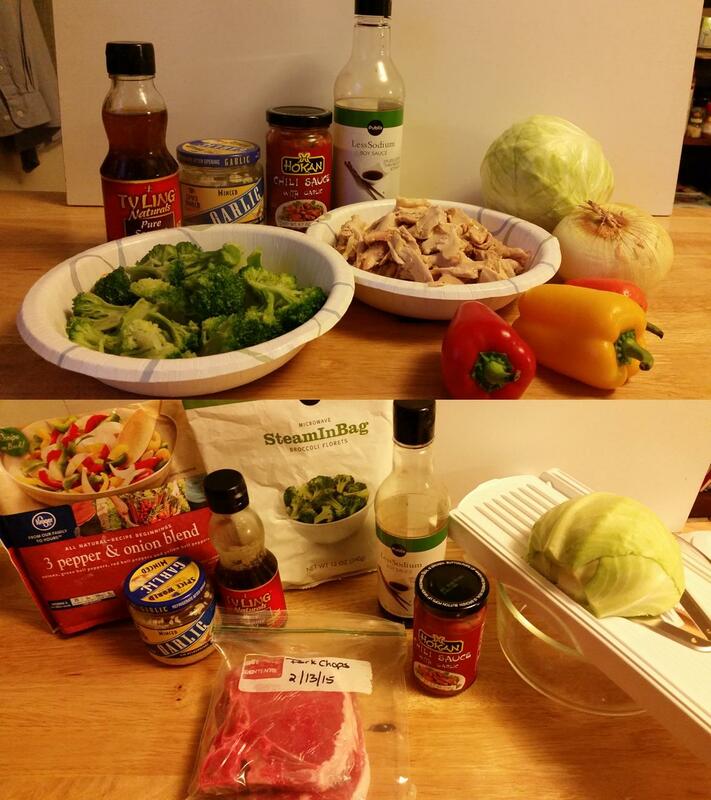 As you can probably tell by the images, I’ve made this twice, once with chicken, fresh peppers and knife-chopped cabbage and again with pork (from a “variety” pack of pork chops), a frozen peppers and onion blend, and mandolined cabbage. The first time I made it, I used the mini sweet peppers that can be found at most grocery stores which I like to keep on hand for salads. The second time, I decided to try the frozen, pre-sliced peppers and onion mix. I only used a cup and a half, or about half the bag and ended up not liking that idea as much—I wasn’t as happy with the amount of green pepper in the mix, there wasn’t enough onion, and they cooked down a lot more than I wanted before the pork was cooked all the way through. To shred the cabbage, I cut off the stem end, then split the head down the center. For both the hand-cutting and the mandoline slicing, I started at the stem end and then worked my way up the half. The mandoline technique gave me very thin, noodle-like ribbons; however, they cooked down much more quickly than I’d anticipated, so it ended up a little overcooked. This is one of those recipes that’s great for adjusting to your personal tastes. And it makes a great meal in and of itself.